A comment at Gen Con and a few unusual domain registrations have the internet whispering that Atari is getting ready to announce a new Neverwinter Nights. It was all the way back in 2002 when BioWare and Atari released Neverwinter Nights, BioWare's first game after wrapping up the epic Baldur's Gate saga. 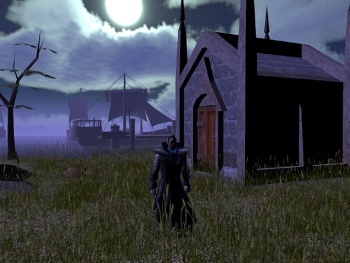 Three expansions and countless fan-made mods followed, as did a sequel in 2006, which earned three official expansions of its own. And now it looks like maybe, possibly, we might be getting more. Rumor Component Number One: According to Critical Hits, Atari let slip at Gen Con that it "has an announcement about some kind of D&D videogame," but couldn't talk about it at the time. Rumor Component Number Two: As uncovered by superannuation, Atari recently registered several suspicious-sounding new domains, including visitneverwinter.com, neverwinter-game.com, playneverwinter.com and saveneverwinter.com. Put the two together and what you end up with looks very much like a finger pointed squarely at the northern region of Faerun. While we wait for Atari to drop the other shoe, meanwhile, I'm keeping my own fingers crossed. Nothing I'd like better than some fresh, frozen D&D action. Stay tuned!